The Kings River is a 132.9-mile (213.9 km) river draining the Sierra Nevada mountain range in central California in the United States. Its headwaters originate along the Sierra Crest in and around Kings Canyon National Park and form the eponymous Kings Canyon, one of the deepest river gorges in North America. The river is impounded in Pine Flat Lake before flowing into the San Joaquin Valley (the southern half of the Central Valley) southeast of Fresno. 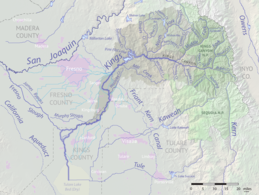 With its upper and middle course in Fresno County, the Kings River diverges into multiple branches in Kings County, with some water flowing south to the old Tulare Lake bed and the rest flowing north to the San Joaquin River. However, most of the water is consumed for irrigation well upstream of either point. Map showing the Kings River and its tributaries. The canal system fed by Kings River is shown in light blue. Inhabited for thousands of years by the Yokuts and other native groups, the Kings River basin once fed a vast network of seasonal wetlands around Tulare Lake that supported millions of waterfowl, fish, and game animals, in turn providing sustenance for indigenous peoples. Tulare Lake was once the largest freshwater lake in the western U.S., at the middle of an endorheic basin also fed by the Kaweah, Tule and Kern Rivers. The river was named by Gabriel Moraga, the commander of a Spanish military expedition in 1806, but it was not until California became a U.S. state in 1850 that many Europeans arrived and settled along the Kings River, driving out the area's original inhabitants. Logging and livestock grazing inflicted significant environmental damage on the upper parts of the river system, before the federal government moved to establish national parks and preserves there. The Kings has a long history of water development, going back to the mid-19th century when farmers made their first attempts to irrigate with Kings River water. In the early 1900s Tulare Lake and its surrounding wetlands were diked, drained and reclaimed for agriculture; the construction of Pine Flat Dam in the 1950s tamed the river's seasonal floods. The battle for control over Kings River water produced extended conflicts, including a set of dams proposed in what would become Kings Canyon National Park. Today, the river irrigates about 1.1 million acres (4,500 km2) of some of the most productive farmland in the country, and is also used extensively for hydropower generation, and water-based and backcountry recreation. All three forks of the Kings River originate as snowmelt in the high Sierra Nevada mountains. The Middle and South Forks begin in Kings Canyon National Park, and join in the Monarch Wilderness (Sierra and Sequoia National Forests) to form the Kings River. The North Fork, which begins in the John Muir Wilderness of the Sierra National Forest, joins the Kings River further downstream near Pine Flat Lake, the only major reservoir on the river. Much of the upper Kings River consists of remote backcountry and wilderness areas, accessible only by non-motorized trails. The entire upper course of the Kings River is in Fresno County; in the Central Valley, the Kings River also flows through parts of Tulare County and Kings County. 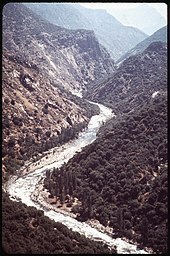 The 44-mile (71 km) South Fork is the longest tributary of the Kings River, originating on the Sierra Crest at the far eastern edge of Kings Canyon National Park. It flows south, then flows west through the Cedar Grove section of Kings Canyon, a glacial valley with high granite cliffs and a meadow floor which has been compared in appearance to Yosemite Valley. The Middle Fork flows for 37 miles (60 km) through some of the park's most difficult-to-access backcountry, including Simpson Meadow and Tehipite Valley. The South and Middle Forks converge in the Monarch Wilderness at an elevation of 2,257 feet (688 m) just outside the national park to form the Kings River in the deepest part of Kings Canyon. With 10,051-foot (3,064 m) Spanish Peak towering above the north side of the river, and summits as high as 8,400 feet (2,600 m) on the south side, Kings Canyon is both deeper and narrower than the Grand Canyon. Below the confluence of the Middle and South Forks, the Kings River flows swiftly westward for about 30 miles (48 km), carving a canyon more than 5,000 feet (1,500 m) deep in places. Major tributaries of the Kings River in this section include Tenmile and Mill Flat Creeks, both from the south; a dam on Tenmile Creek creates Hume Lake. Another notable feature along this area of the Kings Canyon is Garlic Falls, a tiered waterfall on a tributary of the Kings more than 800 feet (240 m) in height. The canyon is roadless as far as the Upper Kings Campground near Verplank Creek; below the campground the river is followed by Trimmer Springs Road. The Kings River passes Rodgers Crossing and receives the North Fork from the right near Balch Camp. The North Fork is about 40 miles (64 km) long and flows mainly through the Sierra National Forest. It is dammed at Wishon Reservoir, which serves as the lower reservoir for the Helms Pumped Storage Plant, one of the biggest pumped-storage hydroelectric plants in California. The North Fork passes through several other hydro plants before it joins with the Kings River. The main Kings then flows into Pine Flat Lake, the large reservoir created by Pine Flat Dam, which can store up to 1,000,000 acre feet (1.2 km3) of water. Constructed in 1954, Pine Flat Dam provides flood control, irrigation and hydroelectricity for the southern San Joaquin Valley. The Kings River emerges from the foothills of the Sierra Nevada near Piedra, about 10 miles (16 km) downstream of Pine Flat Dam. From there it flows across the gently sloping alluvial plain of the San Joaquin Valley, which today is one of the most productive agricultural regions of the United States. Here the Kings River encounters a large number of diversions that serve both irrigation and flood control purposes. Two key irrigation structures along the lower river are the Fresno Weir and People's Weir; both divert a substantial part of the river's flow into canals. The Kings River flows south-southwest past Sanger and Reedley, crossing briefly into northwest Tulare County before entering Kings County. At Kingsburg Cole Slough splits off to the northwest, rejoining the main stem about 10 miles (16 km) downstream at Laton. About 6 miles (9.7 km) north of Lemoore the Kings River splits into a pair of distributaries, the North Fork and the South Fork (not to be confused with the North and South Forks upstream in the Sierra Nevada). The Army Weir controls the amount of water flowing into either branch. Fresno Slough diverges from the North Fork and flows northwest, seasonally carrying floodwaters from the Kings River to the San Joaquin River at Mendota. This is the only branch of the Kings River to reach the San Joaquin, and consequently the Pacific Ocean. The remainder of the North Fork turns south below Fresno Slough, rejoining the South Fork west of Lemoore. There is also a smaller distributary called Clark's Fork which splits from the South Fork and enters the North Fork just above where all the forks re-join. From there the Kings River flows due south through Kings County, past Stratford, and approaches the old Tulare Lake bed. At this point, the Kings is usually a small stream or completely dry due to all the diversions upstream. The river terminates about 10 miles (16 km) northeast of Kettleman City at a junction with a canal carrying water from the Tule River. Today, the 44,000-acre (18,000 ha) old lake bed is used for agriculture and diked to prevent flooding; floodwaters are pumped into about 4,700 acres (1,900 ha) of evaporation basins. In most years, the dams on the Kings and other rivers flowing into Tulare Lake, and the extensive canal diversion system surrounding the lake, are sufficient to prevent flooding. However, the lake occasionally reforms in very wet years. The Kings River is the largest river draining the southern Sierra Nevada. Its average annual flow of 1,791,000 acre feet (2.209 km3) makes it larger than the Kern, Kaweah and Tule Rivers combined. Before the construction of Pine Flat Dam in 1954, the Kings River reached monthly averages as high as 12,000 to 14,000 cubic feet per second (340 to 400 m3/s) in May and June where it flows into the San Joaquin Valley, and averaged as low as 100 to 200 cubic feet per second (2.8 to 5.7 m3/s) in the driest months of September and October. After the dam was built, late spring-early summer high flows have been reduced, and late summer-autumn flows have greatly increased. In the winter season of mid-November through April, rainstorms at lower elevations commonly flood the Kings River, although with less volume than the summer melt. Annual precipitation can be as high as 20 to 50 inches (510 to 1,270 mm) in the Sierra; however, in the San Joaquin Valley the climate is semi-arid to arid with annual precipitation of 5 to 12 inches (130 to 300 mm), decreasing as one moves further west. The lower Kings River forms a large and gently sloping inland delta, or alluvial fan, extending laterally across the Central Valley – the resulting material from millions of years of erosion that carved Kings Canyon. The alluvial fan raised the elevation of the valley floor and blocked water flowing northward into the San Joaquin River, essentially creating a large bowl in the southern part of the valley, forming the Tulare Lake basin. Soils on the alluvial slope are generally sandy, permeable and fertile, creating ideal conditions for farming; in lower elevations and old lake beds the soil is more alkaline and less fertile. Before people began building levees and dikes in the 19th century to contain flooding, the Kings River experienced frequent channel avulsion during high flow events, sometimes flowing north into the San Joaquin River via various sloughs, at other times south into Tulare Lake, and often into both. Historically, the river had a wide floodplain characterized by a system of vernal pools, oxbow lakes, and seasonal channels and marshes that supported a dense riparian habitat. The overflow area began near present-day Kingsburg and continued from there south to Tulare Lake. In extremely wet years, Tulare Lake could fill to such an extent that it backed up the lower Kings River and overflowed through Fresno Slough into the San Joaquin River. All this intermittent flooding over thousands of years built up the valley's huge groundwater reserves, which today are a vital water source for agriculture. The Kings Subbasin aquifer, as defined by the California Department of Water Resources, contained in 1961 a total of 93 million acre feet (115 km3), a level that has since been gradually declining due to intensive pumping for irrigation. Since the beginning of the 21st century, the Kings River basin has experienced an increased number of dry years and particularly high temperatures in Kings Canyon National Park. The 2014–2015 water year was the driest for the Kings basin since official records began in 1895. Climate change is projected to significantly decrease the flow of the river by 2100. According to a 2014 study by UC Merced and UC Irvine researchers, average river flow could drop as much as 26 percent, due to warming temperatures causing increased plant growth in high elevations of the Sierra with a corresponding increase in evapotranspiration. The amount of available water in summer could also decrease due to more precipitation falling as rain in winter, rather than being stored in snowpack. Although most of the original wetlands and riparian zones in the valley have been lost to development, narrow riparian corridors still exist along 40 miles (64 km) of the Kings River between Pine Flat Dam and People's Weir (below Highway 99), and in other places such as lower Fresno Slough. :227 The largest riparian habitats are concentrated in the Centerville Bottoms, east of Sanger, where the river divides into multiple channels over a roughly 5-mile (8.0 km) wide area. Below Highway 99 the river channels, with few exceptions, are almost completely channelized and modified from their native state. A minimum Kings River flow of 100 cubic feet per second (2.8 m3/s) is maintained at all times via releases from Pine Flat Dam, in order to support fish populations and riparian habitats. In the foothills, California oak woodlands consisting mainly of blue and black oak occur along the Kings River, Mill Creek and other perennial tributaries. Other foothill areas are dominated by thick chaparral and brush. At lower to middle elevations in the Sierra Nevada portion of the watershed, mixed conifer forests are the primary habitat, with ponderosa pine and yellow pine being dominant. Some areas, such as the steeper and more exposed north wall of Kings Canyon, remain primarily chaparral and brush. Giant sequoias are found in this area of the watershed. The General Grant Grove is located about 10 miles (16 km) southwest of the Middle and South Fork confluence; the Kings River groves, a set of four smaller groves, are situated lower in elevation and close to the South Fork. Higher up in the Sierra, subalpine forests below the treeless alpine zone are characterized by red fir, lodgepole pine, whitebark pine, mountain hemlock and foxtail pine. Above 10,000 feet (3,000 m) in elevation, glacial features such as cirques and tarns characterize the landscape, with various wildflower and shrub species occurring in between areas of bare rock. Although the high country is usually covered in snow from November to May, as many as 600 plant species occur in the alpine zone of Sequoia-Kings Canyon National Parks, and twice that many are present in other parts of the parks. Starting in 2002, the U.S. Forest Service managed certain areas of the Kings basin under the Kings River Experimental Watersheds program, whose various activities include vegetation thinning and prescribed burns to address overgrowth, erosion and wildfire risk with the overall goal of improving water quality. These sites are concentrated mostly around the North Fork and Pine Flat Lake. Above Pine Flat Dam, the Kings River holds native rainbow trout as well as introduced brown trout and smallmouth bass; the Upper Kings is designated a "Wild Trout Water" by the California Department of Fish and Game. Rainbow trout are also present in the river below the dam; however, the installation of a hydroelectric plant at Pine Flat Dam in 1984 diminished the cold water supply in the reservoir and deteriorated rainbow trout habitat as a result. In 1999, the state of California implemented the Kings River Fisheries Management Program, which has helped recover the fishery by mandating a minimum cold water pool of 100,000 acre feet (0.12 km3) in Pine Flat Reservoir, and enforcing angling restrictions. Other fish species in the lower Kings include native Sacramento pikeminnow and Sacramento sucker (also present in smaller numbers upstream), and introduced species such as common carp, channel catfish and striped bass. The Yokuts mainly lived along the Kings River below the foothills and along the marshy fringes of Tulare Lake. The extensive oak forests in the Kings River riparian zone provided acorns, their main source of food. Wetlands provided them with abundant fish, waterfowl, fur-bearing animals including beaver and river otter, and edible roots. Tule rushes provided material for roofing their pit houses and building rafts and canoes, the main form of transport in the often flooded low country. The Yokuts traded with Paiute peoples (the Mono) in the Great Basin to the east, via various trails across the Sierra Nevada, one of which may have been via Kearsarge Pass at the eastern end of Kings Canyon. About 500 years ago, some of the Mono migrated west, settling in the foothills of the Sierra Nevada above Yokuts territory, where they eventually formed a distinct subgroup known as the Western Mono. The first recorded Spanish explorers to see the Kings River were the members of Gabriel Moraga's expedition, which camped along the river on January 6, 1806, the day of the Epiphany. Thus, they named the river El Rio de los Santos Reyes ("River of the Holy Kings"), later shortened to Rio Reyes, Rio de los Reyes or other variations thereof. :194 Father Pedro Muñoz, a member of the 1806 expedition, wrote: "All the meadows are well covered with oak, alder, cottonwood and willow. The river abounds with beaver and fish. It is a location suitable for a mission, although there would also have to be a presidio." Extending the California mission system inland was a major goal of the Spanish Empire in the 1800s. However, no missions were ever established along the Kings River or elsewhere in the Central Valley. From the 1860s to the early 1900s, logging was one of the biggest industries in the upper Kings River. In 1890 two San Francisco businessmen purchased 30,000 acres (12,000 ha) in the upper Kings watershed and founded the Kings River Lumber Company, intending to log the area's abundant giant sequoias. Between 1890 and 1926 a huge logging operation was extended across the mountains, an area including Converse Basin Grove – then the world's largest grove of sequoias – which was almost completely clear-cut. A dam was built to form Hume Lake, feeding a flume running more than 40-mile (64 km) down Kings Canyon to carry logs to the mill in Sanger. Despite the scale of the venture it was ultimately unprofitable. Sequoia wood is soft and unsuitable for most construction; in addition, the trees were so tall that they often shattered into unusable pieces when they hit the ground. When John Muir visited and wrote about the Kings River and its canyon in the late 19th century, he brought attention to the area's potential as a tourist attraction and its merit as a nature preserve. :88 Muir lobbied for the preservation of the sequoia groves above the Kings River, which include General Grant Grove, home to the world's second largest tree. :13 Due to his efforts and those of local politicians and civic activists, President Benjamin Harrison signed a bill establishing General Grant National Park in October 1890. 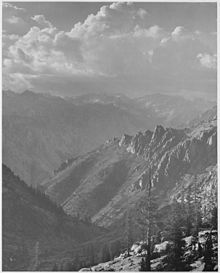 However, it would not be until 1940 when the park was extended to the middle and south forks of the Kings River and renamed Kings Canyon National Park. Starting in 1870 the settlement of the region began in earnest, and larger and more permanent water supply systems were built. :106 Long canals brought water to the large, semi-arid prairie between the Kings and San Joaquin rivers, enabling the growth of Fresno and attracting many more settlers to the area. Farming cooperatives or "colonies", where large landowners subdivided many small plots for individual farmers, were a popular early pattern of settlement and attracted immigrants from the eastern United States, Europe, and Asia. :45–46 A few individuals were able to amass huge land holdings by exploiting loopholes in the Homestead Act and Swamp Land Act, the most successful being J.G. Boswell and his nephew James G. Boswell II, who acquired as much as 200,000 acres (81,000 ha) in the lower Kings and the Tulare Lake bed. Despite portions being sold off since the 1980s, the Boswell family farm remains the largest privately owned farm in the world, at 150,000 acres (61,000 ha). The Wright Act of 1887 allowed farmers to organize into irrigation districts, enabling them to pool their resources and greatly extend the reach of canal systems. The Alta Irrigation District, established in 1888, was the first; it would be followed by at least eighteen others (some of which have since been consolidated). However, drought spawned conflict between earlier landowners with riparian rights and their newly arrived counterparts. In the days before Pine Flat Dam, the river often dropped too low by August or September to satisfy all the demands on it, and often disputes escalated to armed conflict over the control of canal gates. In 1897 the first Kings River water agreement was made, establishing irrigation districts' legal priority to water, resolving many lawsuits. However, by 1913 practically all the Kings River's water was being used and farmers demanded a solution. In 1919 state engineer Charles L. Kaupke was assigned as the first Kings River "watermaster" – a role he served until 1956 – to settle issues of rationing and establish a "diversion schedule" to reduce water waste. Political conflict raged on for more than ten years, with the Corps ultimately being authorized to build the dam, and the Bureau authorized to manage water storage. The dam was constructed between 1949 and 1954; only 19 months after its dedication, it stopped the monstrous flood of December 1955, the largest recorded flood on the Kings since at least 1862, sparing downstream towns from heavy damage. :6–12 In 1963 all Kings River water users signed an agreement with the Bureau of Reclamation establishing their shares of storage in Pine Flat Lake, granting them "perpetual rights to use of storage subordinate only to flood control purposes," and in 1969 the California Department of Water Resources declared the Kings River fully appropriated, meaning that no new water rights can be claimed, unless bought from existing rights-holders. Almost all of the Kings River's water is consumed for agriculture. The river irrigates about 1.1 million acres (4,500 km2) of some of the most productive farmland in the United States; in 2009 the Kings delta produced crops valued at more than $3 billion. Fresno County, which is mostly supplied by Kings River water, ranked first among U.S. counties for agriculture sales in 2012. Tulare and Kings Counties ranked second and tenth, respectively. The main crops grown in the Kings River service area are grapes, citrus, grain, and various fruits and nuts. Other crops include alfalfa, berries, rice, and miscellaneous nursery and field crops. More than 1,000 miles (1,600 km) of man-made canals deliver water to fourteen irrigation districts in the San Joaquin Valley. The Fresno, Kings River, Consolidated, Raisin City, Liberty and Laguna districts are located to the west of the river; the Tri-Valley, Hills Valley, Orange Cove, Alta and Kings County districts are located to the south. Kings River water also supplies the Riverdale, Stilson, James, Tranquility and Mid-Valley districts via Fresno Slough. Surface water deliveries have been managed by the Kings River Water Association (KRWA), headed by the Kings River watermaster, since 1927. The KRWA oversees the water supply to 28 member agencies and about 20,000 farms in the Kings River service area, and is responsible for adjudicating water rights as well as regulating water quality. A monthly "water entitlement schedule" determines how much water each agency receives, contingent on the flow of the Kings River. 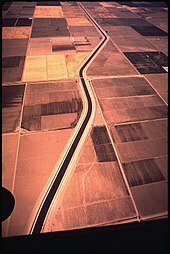 The Friant-Kern Canal, a part of the Central Valley Project (CVP), is the only source of surface water from outside the Kings River basin. Only the Fresno Irrigation District is contracted for CVP water, but other Kings River users can also purchase CVP water in times of need, such as droughts. Summer water demand for irrigation is typically in the range of 6,000 to 7,000 cubic feet per second (170 to 200 m3/s). Groundwater is the other major source of water supply for the basin, providing a large part of the agricultural supply and all of the water used by area cities. The Kings River Conservation District (KRCD), among its other functions, is the primary agency managing groundwater use. The Kings Basin Water Authority also monitors groundwater use, as well as certain water conservation, water quality and environmental functions. The Kings River provides more than 100,000 acre feet (120,000,000 m3) of groundwater recharge to the local aquifer each year. However, depths to groundwater have been increasing for many years, indicating concern for the safe yield of the aquifer. The annual overdraft is estimated at 100,000 to 150,000 acre feet (120,000,000 to 190,000,000 m3). 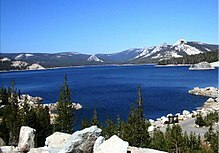 Courtright Reservoir is the upper reservoir for the Helms Pumped Storage Plant, the largest power station of its kind in California. The Kings River system has several major hydroelectric plants; the only one on the main stem is the 165-megawatt (221,000 hp) Jeff L. Taylor Pine Flat Power Plant, located at the base of Pine Flat Dam. KRCD has operated the power plant since its completion in 1984. Power generation at Pine Flat Dam is incidental, meaning it is governed by demand for irrigation water or flood control requirements rather than demand for power. There was a proposal to add one more dam on the Kings River near Piedra, which would create a small regulating reservoir below Pine Flat Dam, allowing the power station to be used for peaking purposes while releasing a stable flow for irrigation. Due to environmental concerns and a poor cost-benefit ratio this project was never built. Further upstream, the three forks of the Kings have considerable hydropower potential due to their large drop in elevation from the Sierra crest. However, because the Middle and South Forks are located in Kings Canyon National Park, only the North Fork is utilized for hydroelectric generation. The Haas, Balch No.1 and No.2, and Kings River powerhouses on the North Fork were built between 1927 and 1959 by Pacific Gas and Electric Company (PG&E) and can collectively produce 335 megawatts (449,000 hp). In 2010, the four North Fork powerhouses plus Pine Flat generated more than 2 billion kilowatt hours (7200 TJ) of energy. Between 1977 and 1984, PG&E constructed the 1,212-megawatt (1,625,000 hp) Helms Pumped Storage Plant located between the Wishon and Courtright Reservoirs. The Helms plant, which pumps water up into Courtright during periods of low demand and releases it during high demand periods, is crucial to stabilizing the California electric grid by providing peaking power. During the first half of the 20th century, the Kings River was the focus of a political fight over Los Angeles' proposal to dam the Middle and South Forks for power generation. Local farmers feared the city's real intention was to divert Kings water south, as it had gained notoriety for doing in the Owens Valley water wars. The KRCD, however, also wanted to dam these rivers for irrigation, and thus the proposed dam sites were excluded from Kings Canyon National Park as designated in 1940. It was not until 1965 when these areas were finally added to the park, ending a debate which had lasted more than sixty years. Today, the 11,449-foot (3,490 m) fall from the head of the South Fork to Pine Flat Reservoir remains the longest undammed drop of any U.S. river. Pine Flat Dam, holding up to 1,000,000 acre feet (1.2 km3) of water, is the primary flood control facility in the Kings River Basin. The winter and spring flood control reservation is 475,000 acre feet (0.586 km3), although the reservoir can be drawn down further depending on the size of the Sierra snowpack. During the winter and spring, the U.S. Army Corps of Engineers is responsible for determining the water release from Pine Flat Dam. The dam provides flood protection for 80,000 acres (32,000 ha) of farmland along the Kings River and another 260,000 acres (110,000 ha) in the old Tulare Lake bed. Pine Flat Dam is operated so that the flow at Crescent Weir (about 50 miles (80 km) downstream of Pine Flat, near Riverdale) does not exceed 4,750 cubic feet per second (135 m3/s), although this amount is frequently exceeded due to the large size and heavy runoff from the Kings watershed. The floodwater capacity of the Kings River falls dramatically in downstream areas, from 50,000 cubic feet per second (1,400 m3/s) between Pine Flat Dam and Highway 180 to 13,000 cubic feet per second (370 m3/s) at Kingsburg. The key flood control facility on the lower river is the Island Weir and Army Weir complex, which control the water flow into the north and south forks of the Kings River, respectively. Flood flows up to 4,750 cubic feet per second (135 m3/s) are sent north; flows of up to 1,200 cubic feet per second (34 m3/s) above that level are diverted south into the Tulare Lake bed, and flows above that combined level are sent north. On the north fork floodwaters are again divided at the Crescent Weir with the first 4,750 cubic feet per second (135 m3/s) sent north via Fresno Slough and James Bypass into the San Joaquin River, and the next 2,000 cubic feet per second (57 m3/s) south into the Tulare Lake bed. Any flows exceeding the total 7,950 cubic feet per second (225 m3/s) channel capacity of the north and south Forks are divided in whichever direction is currently safer. The Kings River Conservation District (KRCD) is in charge of maintaining the system of flood control channels and levees. On the lower river west of Highway 99, the KRCD has worked since the 1950s to maintain the floodwater capacity of the Kings River and its various distributaries in the San Joaquin Valley. The KRCD service area consists of 140 miles (230 km) of levees starting from below Kingsburg, to SR 145 on the North Fork of the river, and to near Stratford on the South Fork. During flood conditions, KRCD patrols the levees 24 hours a day to monitor and repair any damages. Since its construction in 1954, Pine Flat Dam has not provided the high degree of flood protection originally intended by the project. An average of 200,000 acre feet (0.25 km3) of water are spilled each year because the reservoir is not big enough to hold it. In 1969 a total of 1,017,000 acre feet (1.254 km3), more than the entire capacity of the lake, flowed over the spillway, causing heavy damage downstream. The Bureau of Reclamation has studied the possibility of raising Pine Flat Dam to store more water. In addition, local irrigation districts are engaged in efforts to use floodwater for groundwater recharge rather than allowing it to drain away, including the use of certain farm fields as temporary flood basins in winter. This will both reduce flood damage and provide more water for farmers' use. The upper reaches of the Kings River, including the entirety of the Middle Fork and most of the South Fork, flow through rugged backcountry that can be reached only by foot or on horseback. The Middle and South Forks are part of the National Wild and Scenic Rivers System, as is about 15 miles (24 km) of the main Kings below their confluence. About 65.5 miles (105.4 km) are classified as Wild and 15.5 miles (24.9 km) as Recreational. The North Fork is more accessible, with boating, camping and visitor facilities at Wishon Reservoir and a boat launch at Courtright Reservoir. Whitewater rafting and kayaking on the Middle and South Forks is "extremely dangerous" and is usually only done by experts. However, the main Kings between the Garnet Dike put-in and Pine Flat Lake is a popular run for both commercial rafting companies and private boaters. According to the Forest Service, "the Kings River has the highest volume of water which can safely be rafted in the Sierra Nevada", and due to the large size and high elevation of its drainage basin it has a longer boating season than most other Sierra rivers. The Kings River and its forks above Pine Flat Lake has naturally reproducing populations of rainbow trout, brown trout and brook trout. Fishing access above Pine Flat Lake extends as far upstream as Garlic Falls; beyond there, the canyon is too narrow to enter safely by foot except during periods of extremely low water. In lower elevation reaches and in the reservoir, smallmouth bass and spotted bass are common. Below Pine Flat Dam the Kings River is wide and slow-flowing, with tailwater fishing for trout roughly between the dam and Highway 180; further downstream, carp, bass and catfish are more common. The lower river is suitable for swimming, floating and canoeing with many public access points between the dam and Avocado Lake. Below there, most of the banks are private property, with exceptions such as Pierce's Park at Highway 180. Although there are few natural obstructions along the lower Kings, there are a number of diversion weirs that pose a hazard to boaters and must be portaged. Tributaries of the Kings River are listed going upstream from the North Fork/South Fork split near Lemoore. Major lakes/reservoirs and dams are also listed. Distributaries of the Kings River below Lemoore are detailed in the Course section. ^ a b c d "Kings River". Geographic Names Information System. United States Geological Survey. 1981-01-19. Retrieved 2010-09-14. ^ a b c d e f "National Hydrography Dataset via National Map Viewer". U.S. Geological Survey. Retrieved 2017-10-04. ^ a b c "USGS Gage #11222000 on the Kings River at Piedra, CA (Monthly Streamflow)". National Water Information System. United States Geological Survey. 1896–1959. Retrieved 2010-09-14. ^ "USGS Gage #11222000 on the Kings River at Piedra, CA (Peak Streamflow)". National Water Information System. United States Geological Survey. 1896–1959. Retrieved 2010-09-14. ^ "Monarch Wilderness". Sierrawild.gov. Retrieved 2017-01-17. ^ a b United States Geological Survey (USGS). "United States Geological Survey Topographic Map: Reedley, California quad". TopoQuest. Retrieved 2017-10-03. ^ United States Geological Survey (USGS). "United States Geological Survey Topographic Map: Mount Pinchot, California quad". TopoQuest. Retrieved 2017-10-03. ^ Hilton, Spud (2005-07-24). "Crowning Glory / Kings Canyon rivals Yosemite in all but crowds -- and grandeur is easy to get to". SFGate. Retrieved 2018-01-17. ^ "Cedar Grove". Visit Sequoia. Retrieved 2018-01-17. ^ United States Geological Survey (USGS). "United States Geological Survey Topographic Map: Slide Bluffs, California quad". TopoQuest. Retrieved 2017-10-03. ^ United States Geological Survey (USGS). "United States Geological Survey Topographic Map: Tehipite Dome, California quad". TopoQuest. Retrieved 2017-10-03. ^ a b United States Geological Survey (USGS). "United States Geological Survey Topographic Map: Hume, California quad". TopoQuest. Retrieved 2017-10-03. ^ "Description of the Parks" (PDF). Sequoia and Kings Canyon Fire Management Plan. U.S. National Park Service. Retrieved 2006-11-25. ^ "Garlic Falls". World Waterfall Database. Retrieved 2018-01-18. ^ United States Geological Survey (USGS). "United States Geological Survey Topographic Map: Verplank Ridge, California quad". TopoQuest. Retrieved 2017-10-03. ^ United States Geological Survey (USGS). "United States Geological Survey Topographic Map: Luckett Mountain, California quad". TopoQuest. Retrieved 2017-10-03. ^ a b "Helms Pumped Storage Facility". California Energy Commission. Retrieved 2018-04-18. ^ a b "Raise Pine Flat Dam" (PDF). Upper San Joaquin River Basin Storage Investigation. U.S. Bureau of Reclamation. Oct 2003. Retrieved 2018-05-11. ^ United States Geological Survey (USGS). "United States Geological Survey Topographic Map: Piedra, California quad". TopoQuest. Retrieved 2017-10-03. ^ "Guide to Kings River downstream of Pine Flat Dam" (PDF). Kings River Fisheries Management Program. Retrieved 2018-01-18. ^ a b c d e f g h i j k l m n o p "The Kings River Handbook" (PDF). Central Valley Water Awareness Committee. Jun 2003. Retrieved 2018-01-18. ^ United States Geological Survey (USGS). "United States Geological Survey Topographic Map: Sanger, California quad". TopoQuest. Retrieved 2017-10-03. ^ United States Geological Survey (USGS). "United States Geological Survey Topographic Map: Burris Park, California quad". TopoQuest. Retrieved 2017-10-03. ^ United States Geological Survey (USGS). "United States Geological Survey Topographic Map: Laton, California quad". TopoQuest. Retrieved 2017-10-03. ^ United States Geological Survey (USGS). "United States Geological Survey Topographic Map: Riverdale, California quad". TopoQuest. Retrieved 2017-10-03. ^ a b c d e f g h i j "Tulare Lake Basin Hydrology and Hydrography: A Summary of the Movement of Water and Aquatic Species". U.S. Environmental Protection Agency. 2007-04-12. Retrieved 2018-01-18. ^ United States Geological Survey (USGS). "United States Geological Survey Topographic Map: Lemoore, California quad". TopoQuest. Retrieved 2017-10-03. ^ United States Geological Survey (USGS). "United States Geological Survey Topographic Map: Vanguard, California quad". TopoQuest. Retrieved 2017-10-03. ^ United States Geological Survey (USGS). "United States Geological Survey Topographic Map: Stratford, California quad". TopoQuest. Retrieved 2017-10-03. ^ "Tulare Lake Basin". Water Education Foundation. Retrieved 2018-01-18. ^ Middlecamp, David (2017-03-12). "How the 'phantom' Tulare Lake was destroyed by dams". San Luis Obispo Tribune. Retrieved 2017-10-02. ^ "'Phantom' Tulare Lake Comes Back to Life". Los Angeles Times. 1997-02-13. Retrieved 2017-10-02. ^ "USGS Gage #11221500 on the Kings River below Pine Flat Dam, CA (Monthly Streamflow)". National Water Information System. United States Geological Survey. 1954–1990. Retrieved 2017-10-04. ^ a b Harris, Ann G.; Tuttle, Esther; Tuttle, Sherwood D. (2004). Geology of National Parks. Kendall Hunt. ISBN 978-0-78729-970-5. ^ Map Showing Limits of Tahoe Glaciation in Sequoia and Kings Canyon National Parks, California (PDF) (Map). Cartography by James G. Moore and Gregory S. Mack. U.S. Geological Survey. 2008. Retrieved 2017-09-23. ^ "Case Study Report #64: Pine Flat, Kings River" (pdf). CALFED Bay-Delta Program. Retrieved 2018-09-27. 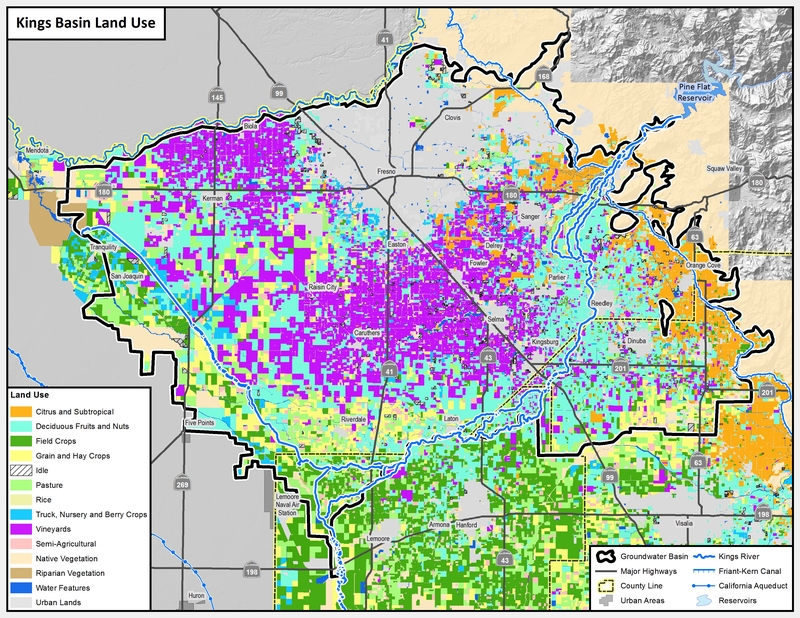 ^ "San Joaquin Valley Groundwater Basin, Kings Subbasin" (PDF). California's Groundwater, Bulletin 118. California Department of Water Resources. 2006-01-20. Retrieved 2018-03-09. ^ Howard, Brian Clark (2014-07-03). "Study Finds "Extreme" Climate Change in National Parks". National Geographic. Retrieved 2018-10-11. ^ "Driest water year ever reported on the Kings". Hanford Sentinel. 2015-09-30. Retrieved 2018-10-11. ^ "Sierra Nevada freshwater runoff could drop 26 percent by 2100". Phys.org. 2014-09-01. Retrieved 2018-10-11. ^ Howard, Brian Clark (2014-09-03). "As California Warms, Greener Mountains Will Mean Less Water for People". National Geographic. Retrieved 2018-10-11. ^ State Route 180 Westside Expressway Route Adoption Study, Draft Environmental Impact Report/Tier I Environmental Impact Statement and Section 4(f) Evaluation. Caltrans. 2011-03-15. ^ "Kings River Public Access and Use". Kings River Conservancy. Sep 2005. Retrieved 2018-03-15. ^ Rojas, Ramiro (2004). "Kings River Project Historic Forest Condition" (PDF). U.S. Forest Service. Retrieved 2018-03-09. ^ "Brief description and location of giant sequoia groves". U.S. National Park Service. Retrieved 2017-09-18. ^ "Subalpine Forests". Sequoia & Kings Canyon National Parks. U.S National Park Service. Retrieved 2017-09-23. ^ a b "Alpine". Sequoia & Kings Canyon National Parks. U.S National Park Service. Retrieved 2017-09-23. ^ "Plants". Sequoia & Kings Canyon National Parks. U.S. National Park Service. Retrieved 2018-03-15. ^ "Kings River Experimental Watersheds (KREW)". U.S. Forest Service. Retrieved 2018-03-15. ^ "Fish Species by Location - 'Town of Lemoore-Kings River-180300120704'". California Fish Website. University of California, Davis. 2014-02-26. Retrieved 2018-03-22. ^ "Fish Species by Location - 'South Fork Kings River-North Fork Kings River-180300120701'". California Fish Website. University of California, Davis. 2014-02-26. Retrieved 2018-03-22. ^ Golla, Victor (2011). California Indian Languages. University of California Press. ISBN 978-0-52026-667-4. ^ Gayton, A.H. (1945). "Yokuts and Western Mono Social Organization". American Anthropologist. 47 (1): 409–426. doi:10.1525/aa.1945.47.3.02a00040. Retrieved 2017-10-04. ^ "The Traveling Beads" (PDF). U.S. National Park Service. Retrieved 2017-10-04. ^ a b Gudde, Erwin G. (2010). California Place Names: The Origin and Etymology of Current Geographical Names. University of California Press. ISBN 978-0-52026-619-3. ^ Kyle, Douglas E.; et al. (2002). Historic Spots in California. Stanford University Press. ISBN 978-0-80477-817-6. ^ Dilsaver, Lary M.; Tweed, William C. (1990). "Arrival of the Anglo-Americans". Challenge of the Big Trees. U.S. National Park Service. Retrieved 2017-09-23. ^ Dilsaver, Lary M.; Tweed, William C. (1990). "Caucasian Settlers Come to the Southern Sierra". Challenge of the Big Trees. U.S. National Park Service. Retrieved 2017-09-18. ^ C. Hart Merriam (1924). "Jedediah Smith's Route across the Sierra in 1827". California Historical Society Quarterly. 3 (1): 25–29. doi:10.2307/25613600. JSTOR 25613600. ^ "Yosemite Nature Notes" (pdf). Yosemite Online. Jul 1951. Retrieved 2018-03-22. ^ Kyle, Douglas E.; et al. (2002). Historic Spots in California: Fifth Edition. Stanford University Press. ISBN 978-0-80477-817-6. ^ Haagenson, Gene (2014-05-12). "A look back at the history of the Valley's log flumes". KFSN. Retrieved 2018-03-24. ^ "History of the Flume". Sanger Depot Museum. Retrieved 2018-03-24. ^ Mary Colwell (2014). John Muir: The Scotsman who saved America's wild places. Lion Books. ISBN 978-0-7459-5667-1. ^ Eldredge, Ward (2009). Kings Canyon National Park. Arcadia Publishing. ISBN 978-0-73855-996-4. ^ Dilsaver, Lary M.; Tweed, William C. (1990). "Expansion of Sequoia and Creation of General Grant". Challenge of the Big Trees. U.S. National Park Service. Retrieved 2017-09-18. ^ Dilsaver, Lary M.; Tweed, William C. (1990). "Harold Ickes and the Final Battle". Challenge of the Big Trees. U.S. National Park Service. Retrieved 2017-09-18. ^ a b Preston, William L. (1981). Vanishing Landscapes: Land and Life in the Tulare Lake Basin. University of California Press. ISBN 978-0-52004-053-3. ^ Preston, William L. (1981). Vanishing Landscapes: Land and Life in the Tulare Lake Basin. University of California Press. ISBN 978-0-52004-053-3. ^ Woeste, Victoria Saker (2000). The Farmer's Benevolent Trust: Law and Agricultural Cooperation in Industrial America, 1865-1945. University of North Carolina Press. ISBN 978-0-80786-711-2. ^ Hirsch, Jerry (2009-04-07). "James G. Boswell II dies at 86; cotton magnate built family farm into agribusiness giant". Los Angeles Times. Retrieved 2017-10-04. ^ a b "Water Agencies Map" (Map). 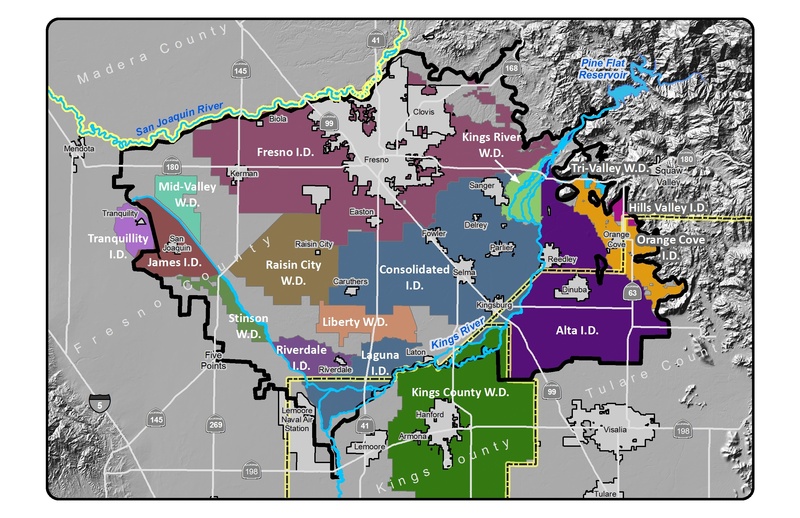 Kings Basin Water: Land Use Planners Packet. Kings Basin Water Authority. Retrieved 2017-10-04. ^ a b Kings River Water Association (2014-05-19). "Sixty Years of Pine Flat Dam". Kings Basin Water Authority. Retrieved 2017-10-04. ^ a b "Case Study Report #64: Pine Flat, Kings River" (PDF). CALFED Bay-Delta Program. Retrieved 2018-04-08. ^ a b Pine Flat Dam Fish and Wildlife Habitat Restoration, Fresno, California. U.S. Army Corps of Engineers. Dec 2001. ^ "2012 Census Highlights: Farm Economics - Record high agriculture sales; income and expenses both up". U.S. Department of Agriculture. May 2014. Retrieved 2017-10-04. ^ "9 California Counties Make Top 10 List for Ag Sales in the U.S." (PDF). U.S. Department of Agriculture. 2014-05-02. Retrieved 2017-10-04. ^ "Kings Basin Land Use". Kings Basin Water Authority. Retrieved 2018-04-08. ^ "Kings Basin Water System". Kings Basin Water Authority. Retrieved 2018-04-08. ^ "Member Units". Kings River Water Association. Retrieved 2018-04-08. ^ "About Us". Kings River Water Association. Retrieved 2018-04-08. ^ "KRWA Water Entitlements". Kings River Water Association. Retrieved 2018-04-08. ^ "Water Management". Kings River Conservation District. Retrieved 2018-04-11. ^ "About Us". Kings Basin Water Authority. Retrieved 2018-04-11. ^ "Kings Basin Water Management Overview" (PDF). Stanford University. Retrieved 2018-04-11. ^ "Pine Flat Power Plant". Kings River Conservation District. Retrieved 2018-04-11. ^ "Final Feasibility Report and Environmental Impact Statement/ Environmental Impact Report: Pine Flat Dam Fish and Wildlife Habitat Restoration, Fresno, California" (PDF). U.S. Army Corps of Engineers. Dec 2001. p. 12. Retrieved 2018-09-25. ^ Water Resources & Information Management Engineering, Inc. (Mar 2006). "Baseline Conditions Technical Memorandum" (pdf). Kings Basin Water Authority. pp. 7–9, 55. Retrieved 2018-09-25. ^ Park, James (2011-05-25). "How PG&E's Hydroelectric Staff Balances the Power of the Sierra Snowpack". Currents. Pacific Gas & Electric Company. Retrieved 2018-04-11. ^ "California Hydroelectric Statistics & Data". California Energy Commission. 2001–2015. Retrieved 2017-10-10. ^ Boyles, Denny (2014-08-01). "Helms at 30: Hydroelectric Plant Delivers Safe, Clean Affordable Energy". Currents. Pacific Gas & Electric Company. Retrieved 2018-04-18. ^ Dilsaver, Lary M.; Tweed, William C. (1990). "The Early Battles". Challenge of the Big Trees. U.S. National Park Service. Retrieved 2017-09-18. ^ "Sequoia and Kings Canyon National Parks: Final General Management Plan and Comprehensive River Management Plan/Environmental Impact Statement". U.S. National Park Service. 2006. p. 35. Retrieved 2017-09-23. ^ Houston, Paul (1987-04-02). "Kings River to Get Federal Protection in Compromise Bill". Los Angeles Times. Retrieved 2018-05-02. ^ "Pine Flat Dam fish and wildlife habitat restoration, Fresno, California" (PDF). U.S. Army Corps of Engineers. Dec 2001. Retrieved 2018-09-20. ^ "Flood Damage Reduction Technical Appendix" (PDF). Upper San Joaquin River Basin Storage Investigation, Initial Alternatives Information Report. U.S. Bureau of Reclamation. Jun 2005. Retrieved 2018-05-02. ^ "Water Management". Kings River Conservation District. Retrieved 2018-05-02. ^ "Kings River Flood Control Maintenance". Kings River Conservation District. Retrieved 2018-05-13. ^ "Rodgers Crossing Reservoir" (PDF). Upper San Joaquin River Basin Storage Investigation. U.S. Bureau of Reclamation. Oct 2003. Retrieved 2018-05-02. ^ Orth, David (2011-07-20). "Elements of On-Farm and Basin-Level Agricultural Water Use Efficiency" (PDF). California State Water Resources Control Board. Retrieved 2018-05-11. ^ "Kings River, California". National Wild and Scenic Rivers System. Retrieved 2018-05-11. ^ Warszawski, Marek (2009-07-30). "Wishon Reservoir". The Fresno Bee. Retrieved 2018-05-13. ^ "Courtright Reservoir Boat Ramp". California Division of Boating and Waterways. Retrieved 2018-05-13. ^ "Fishing Location - Kings River, Upper". California Department of Fish and Wildlife. Retrieved 2018-05-13. ^ "Kings, California, US 4. Pine Flat Dam to Centerville (Route 180)". American Whitewater. Retrieved 2018-05-13. ^ Pine Flat Dam Fish and Wildlife Habitat Restoration Investigation, Draft Environmental Impact Statement/Environmental Impact Report. U.S. Army Corps of Engineers. 2001. pp. 3–7. ^ Nidever, Seth (2017-07-12). "River opens, floating/boating season begins". Hanford Sentinel. Wikimedia Commons has media related to Kings River (California).